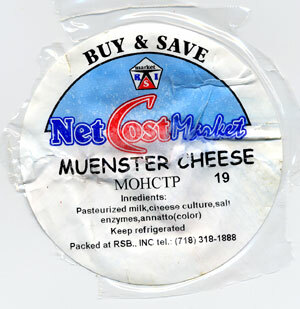 For those of you who do not speak Russian : under “Muenster Cheese” it says “Monster” in Russian. would probably have a fit if he met the person who created this label. Interesting to note that this talented individual stole the Soviet era “quality mark” as the basis of the company’s logo. This logo was stamped on products that passed through some kind of quality control. Of course this meant that after a while every product no matter how crappy had this mark on it. The common joke was that the symbol represents a person shrugging his shoulders and saying apologetically – “I am sorry, this is how they made me”.